Your vision is unlike anyone else’s. Your prescription, the frames you choose, and even the way your eyewear is positioned on your face affect how well your progressive lenses perform for you. 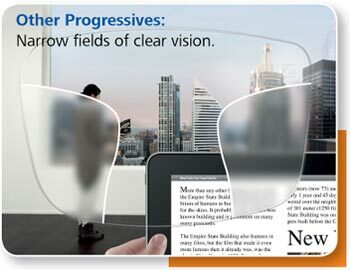 Personalized vision care built into every lens! Allows us to enhance intermediate/dynamic or near vision based on your visual profile. The EyeFit technology lets us personalize ZEISS Progressive Individual 2 for either enhanced intermediate and dynamic or near vision, while preserving outstanding all-day, all-distance performance. Sharpens off-axis vision through a more accurate calculation of the your optical center of rotation. The CORE technology customizes lens optics for each patient’s center of rotation for superior all around vision clarity. Eyefit and CORE technologies are build on the proven customization approach of the original ZEISS Individual. ZEISS Progressive Individual® 2 lenses are tailor-made to work with the frame you’ve chosen, and how they fit your face. You’ll get the optimal balance of distance, intermediate, and reading vision your frame allows. And you’ll never have to choose between looking great and seeing great. The way you use your eyes is unique to you. You may spend more time than most focusing on one main distance (reading, computer work) or your life may emphasize constant refocusing for dynamic activities (driving, sports, gardening). New technology in ZEISS Progressive Individual 2 lenses allows us to enhance either the near or intermediate and dynamic viewing zones of your lenses to suit your visual lifestyle. You’ll benefit from outstanding vision for all distances, with extra vision support where you need it most. The shape and size of the frame you choose can affect how well the lens performs for different viewing distances. Ordinary lenses are designed for an average frame size. If you choose a frame that isn’t average, your distance vision (including far and panoramic vision), intermediate vision (computer screen distance), or near vision (reading distance) may be compromised. It’s not just frame style that affects how well you see. Believe it or not, your facial structure does, too. That’s because your nose and other facial features affect how your frame and lenses are positioned in front of your eyes. And if your lenses are not designed to account for these personal fitting dimensions, the optics will be mis-aligned, and you may not receive the exact lens powers your doctor prescribed.